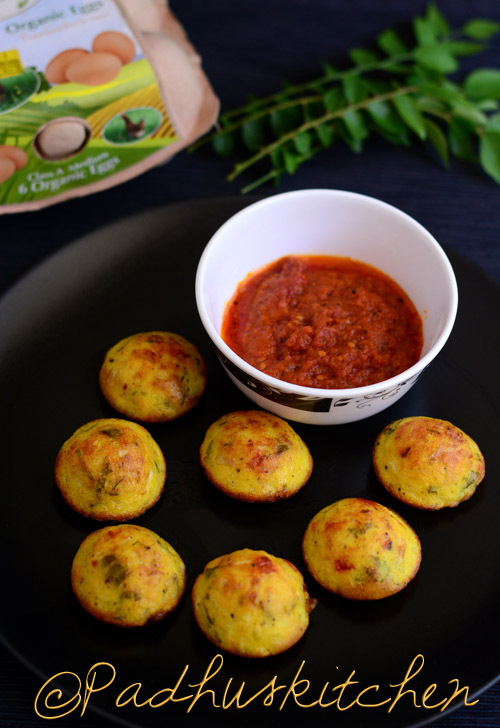 Egg Paniyaram/Chettinad Egg Paniyaram is a quick and easy dish prepared with eggs and dosa batter. It can be had as a light breakfast or as a snack. You can make egg paniyaram even without dosa batter. Today we will learn how to make egg paniyaram with and without dosa batter following this easy recipe with step wise pictures. Finely chop onions, green chillies and tomato (remove the seeds). In a bowl, break 2 eggs, add salt, turmeric powder, pepper powder, 2 tsp water and beat with a fork until foamy. Mix it with dosa batter. Add finely chopped onion, tomatoes, green chilli, coriander leaves and curry leaves. Mix well. Egg paniyaram batter is ready. Heat paniyaram/appe pan, add 1/2 tsp of oil in each hole/cavity. Fill each cavity with the egg paniyaram batter. Cook covered on low heat for few minutes. Flip it over and cook uncovered on low heat for another 2-3 minutes. Flip over 2-3 times if required until both the sides are browned. Remove from pan and serve immediately with tomato chutney or spicy kara chutney. I have tried egg paniyaram without dosa batter also which is also very delicious. Follow the same recipe above omitting the dosa batter. Add 2 tbsp of grated cheese to the egg mixture and make paniyarams following the same method as above. After beating eggs we need to add to dos batter. ..
After beating the eggs, mix it with dosa batter.